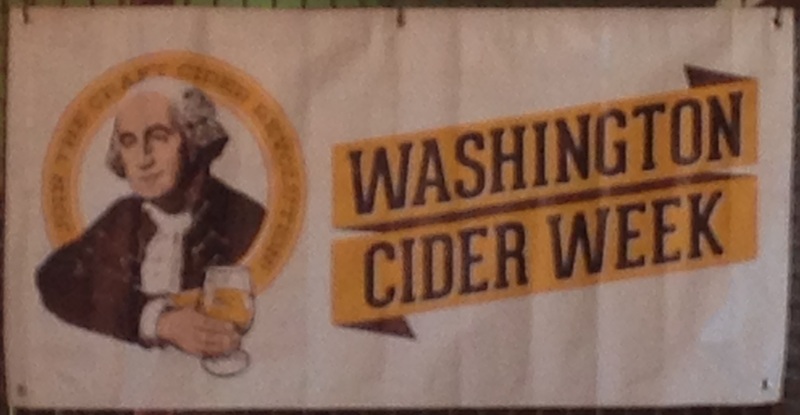 I was recently invited to a Washington Cider Week preview for media and buyers. The 7th annual Washington Cider Week is September 7th-17th 2017, and will include numerous cider events, with Cider Summit Seattle being a main highlight. 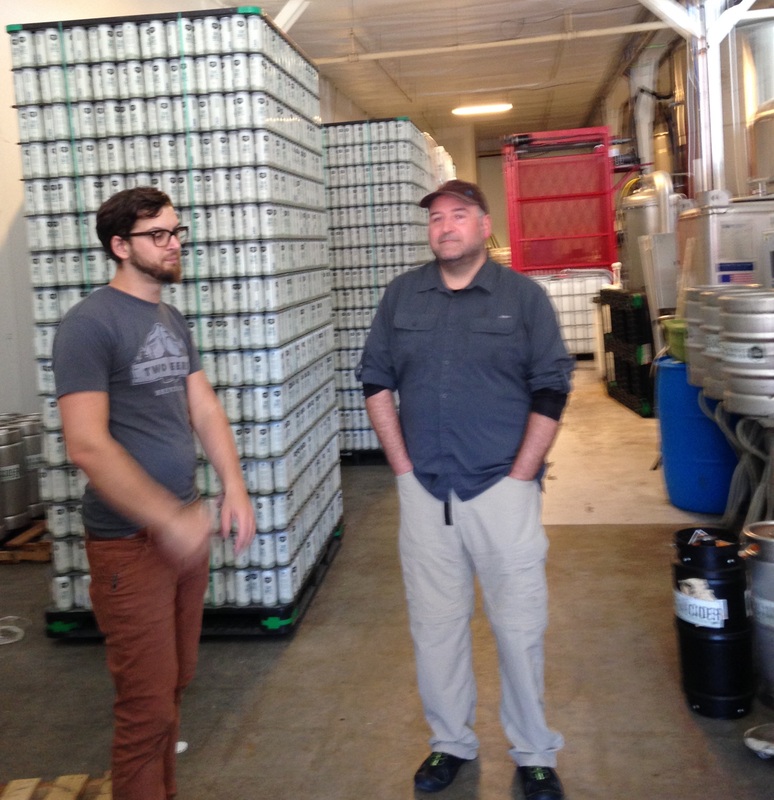 This preview event was hosted by the NW Cider Association, and held midday on a Tuesday at Capitol Cider in Seattle. It was a pretty sweet invite-only event, and I enjoyed the excuse to take a half day off work! My husband even joined me; it was nice to have a driver, as there were eleven PNW cidery representatives pouring samples. Even though there weren’t many new-to-me ciders, it was a great opportunity to get some face time with the pourers, which often isn’t possible at the larger events. Alpenfire Cider (Port Townsend WA): I’ve tried most of their lineup, which includes many favorites, but my husband requested a sample of Glow. It is one of their sweeter options, made from rare red-fleshed apples. It was a good choice as they rarely pour it at events. Awesome as always, semi-sweet, and crazy fruity flavorful without any additives. Bad Granny (Chelan WA): This was my first time seeing them at an event (the cidery is less than a year old). I learned that they are associated with Karma Vineyards, one of the few producers of Methode Champenoise wine in the state. 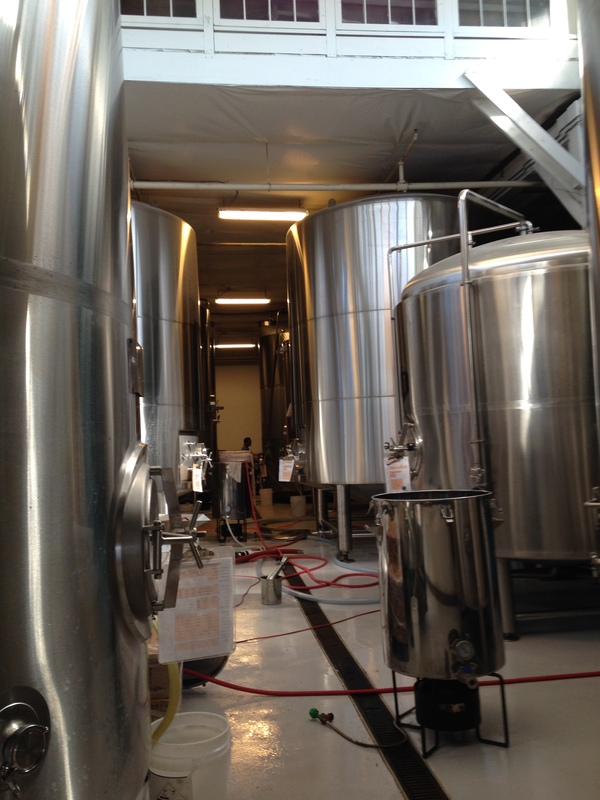 The cidery is a combination of their MC wine experience and their apple orchard family roots. I had tried their flagship Green Apple cider on draft previously (it is also sold in cans), which is a great simple semi-sweet cider option. They also brought their currently draft-only black currant cider, which I found to have only a very mild flavor, but overall was easy to drink, semi-dry to semi-sweet, with a fuller body than expected. I learned of their plans to release some specialty ciders in large format bottles, such as one from red-fleshed apples and one from Dabinett traditional cider apples. Dragon’s Head (Vashon Island WA): They just released this year’s vintage of Kingston Black single varietal cider (which I tried last year). However, I decided to go for the Traditional cider, which is my favorite from them – a semi-dry cider with complex rich bittersweet cider apple flavor. I also sampled the Perry, as I wanted to compare it to the Methode Champenoise version I tried recently; I enjoyed this regular version better as it was sweeter (almost semi-sweet), and more flavorful / fruitier. Sometimes I find that a very high carbonation can impede a cider tasting for me as it makes a cider seem every drier and more acidic than it really is. Finnriver (Chimacum WA): I tried their newish Cider Summit collaboration cider (poured at all four Cider Summit events in 2017 – Chicago, San Francisco, Portland, and next, Seattle), called “Summit Saison”. It is made with organic apples, Saison yeast, dried fruit such as apricots, and spices (which oddly enough included peppercorns). I found it hazy, semi-dry to semi-sweet, with citrus & stone fruit notes with a hint of peppercorn on the finish. I’m not a fan of pepper, even in food, so I wasn’t really sure what to make of it. My husband however was a fan. Liberty Ciderworks (Spokane WA): This was a great opportunity to have a side-by-side tasting of their English-Style and Stonewall (barrel aged) ciders, which I’ve previously found very similar but hadn’t tried together. I preferred the Stonewall, as it was a bit smoother, with less acidic bite, and the added whiskey & oak notes. I also tried Turncoat, their hopped cider, which had nice herbal flavor without bitterness, which was my husband’s favorite. Locust Cider (Woodinville WA): At this stop, as I said I had tried all of the regular line up (which was being poured from their new cans), I was treated to a sample of their limited release Bourbon Barrel Aged cider. It was semi-dry, and very mild at first (especially for 14% ABV), then all of a sudden Bam!, an intense bourbon finish. I thought I hadn’t tried it previously, but I actually had, over a year ago at their tap room (good thing for my Cider List!). I liked it better this time because it was served cold, but despite enjoying the flavor, its not something I would drink too often. 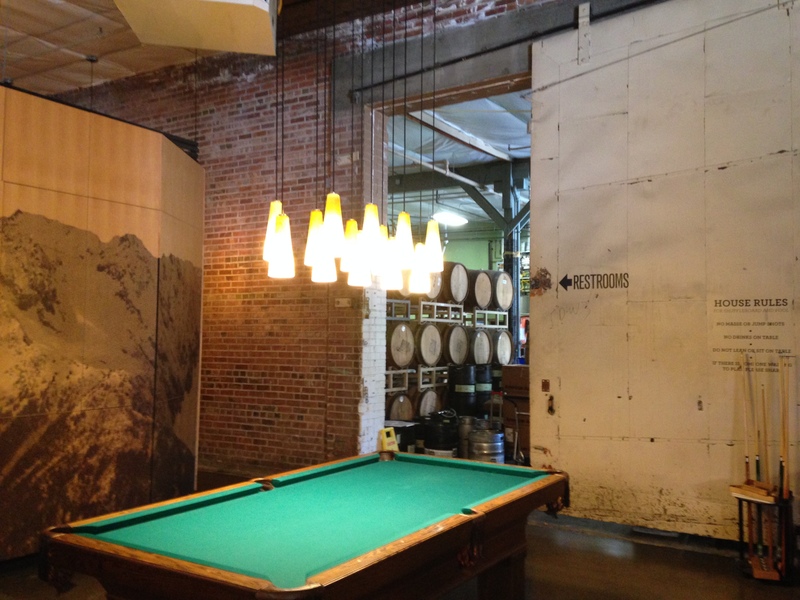 Pear UP – formerly Neigel Vintners / NV Cider (East Wenatchee WA): I had a chance to have a longish chat with the always energetic co-founder Kevin. He shared about the recent NW Cider trip where 10 PNW cidermakers traveled to France & England to learn about keeving (see this article). I also learned about the cidery’s packaging changes, such as new 12oz instead of 16.9oz green Aluminum bottles (with a digital wrap instead of labels), and four packs of 12oz clear glass bottles (which enables that SKU to be at a lower price point). I also learned about some new products they have released, including an interesting new partnership with a distillery, a brewery, and a label artist, resulting in Centre Ring, with an initial release of a cider and a perry, at a nice price point of $11.99 / 750ml bottle. Interestingly enough, Centre Ring doesn’t only focus on cider/perry, but craft beverages and food in general. I started with the new Centre Ring Reserve Pear, which reminded me of a slightly drier and slightly more complex version of their flagship Pear Essentials, as it was semi-dry, medium bodied, and pear-forward with some citrus notes. Next I tried another new-to-me release (draft and bottles), Pearjito Colada; I didn’t pick up any mint, but the coconut was a fun bold flavor in the tasty semi-sweet perry. Lastly, my husband wanted to try the Pearfect Pie, which I had never tried either; it was a bit odd to drink in summer, but is a semi-sweet perry with a hint of pie spice. Schilling Cider (Auburn WA): I tried the Grapefruit & Chill, which I learned was a different recipe than a grapefruit cider I had previously tried which was flavored with SodaJerk grapefruit soda syrup and I wasn’t a fan of; this time it was a surprisingly pleasant citrus-forward and higher carbonation semi-dry cider. I also re-tried the Pineapple Passion, which is one of my favorite Schilling varieties, with some strong tropical flavor, but it is definitely on the sweeter end (semi-sweet to sweet). My favorite from them is the King’s Schilling. 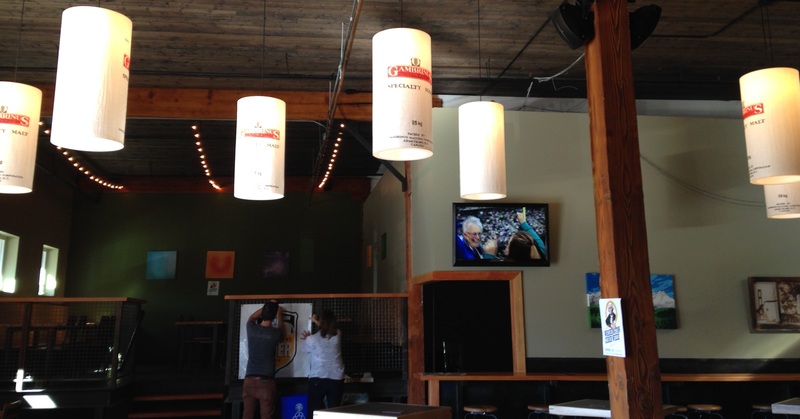 Seattle Cider (Seattle WA): I tried two new draft-only releases. First – Lavender Lemon, a semi-dry cider with the as-advertised flavor notes. Second – Cucumber Hibiscus, which was semi-dry to dry, and started with cucumber on the nose, primarily hibiscus (fruity/floral) in the flavor, and a cucumber finish. They were both more flavorful than most of the ciders I’ve previously had from them. I found both pretty average – plenty drinkable, but not something I would seek out. 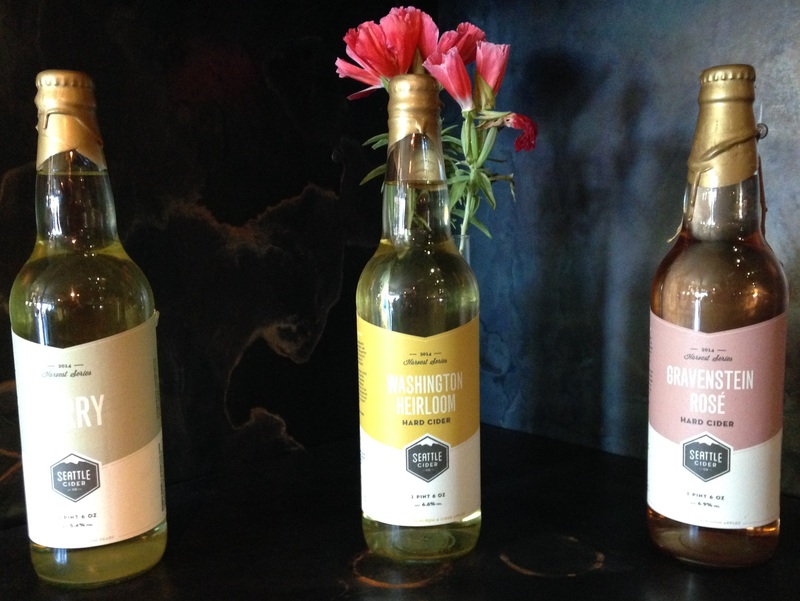 Snowdrift Cider (East Wenatchee WA): No new ciders to try, but I tried the cider I had tried the least of and is the most rare – the Cidermaker’s Reserve. I learned it was made under Methode Champenoise with apples from their 2014 harvest, including bittersweet varieties, and aged 3! years. It is a highly carbonated cider with an awesome texture, on the sweeter side of semi-dry, with a very unique flavor profile – fruity with pomegranate notes, and almost grape champagne-like. I was surprised to hear it had bittersweet cider apples, as it definitely didn’t have the typical profile I’d expect. A fun and unique cider and an excellent value too, at $19 / 750ml (this was my husband’s favorite cider of the event, and he insisted we pick some up afterwards). 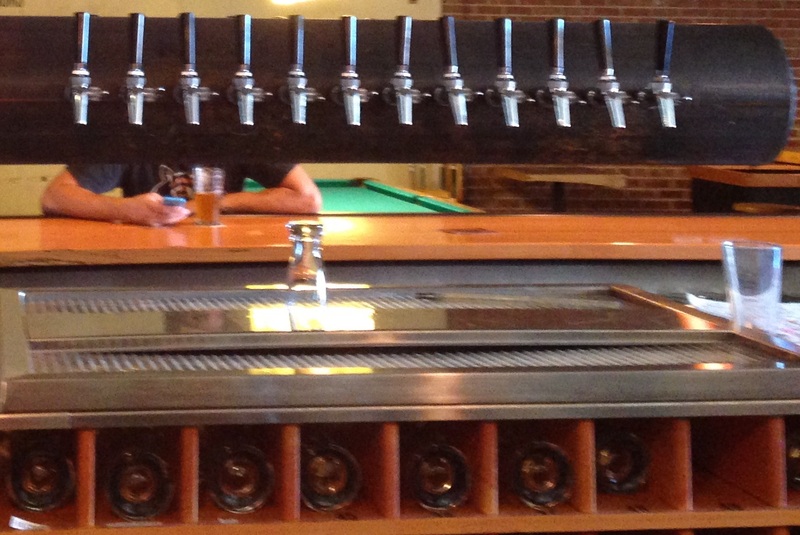 Tieton Cider Works (Yakima WA): No new to me ciders here either, so I re-tried the Sparkling Perry. I re-learned that this is made by keeving and is wild yeast fermented (neither of which I would have guessed nor remembered from my taste nearly two years ago). I’d describe it as a semi-sweet to semi-dry pear-forward perry with fruity citrus notes. They had some nice swag too – tote bags, brochures, postcards, and stickers. I did some serious cider shopping that day, about 12 bottles between Capitol Cider, the Schilling Cider House, and QFC. My coolest finds were at Capitol Cider, as I don’t get there often: EZ Orchards “Pomme” (Pommeau, a mix of apple brandy & cider), last year’s release of Finnriver Fire Barrel (which I liked better than this year’s batch), and two different single varietals from Liberty (that I only thought were available in their tasting room and online). The Schilling Cider House also had a couple new to me releases, a peach wine from Mission Trail and Gasping Goose from Newton’s Court in England. I also picked up a re-supply of Dunkertons Black Fox, my current go-to English cider, and a couple others favorites from Aspall and EZ Orchards. Stay tuned for more posts on Washington Cider Week 2017, especially Cider Summit Seattle. Thursday night was a great kickoff to Washington Cider Week! I started the evening at Seattle Cider (opening ceremonies, although I left before that), then moved on to the Burgundian Bar (East Meets West, An Evening with Eden and Alpenfire Ciders). 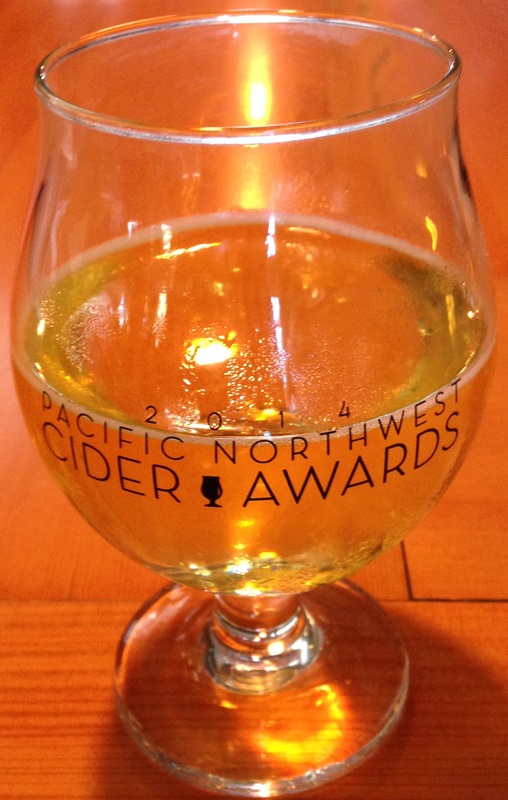 This post will cover Seattle Cider and another will cover the Burgundian (plus many posts to come on Cider Summit and other Washington Cider Week events!). I mostly chose to stop by Seattle Cider as it was a Washington Cider Week event to fill the time between when I got off work and the event at the Burgundian started at 5pm, as the events were located between work and home. 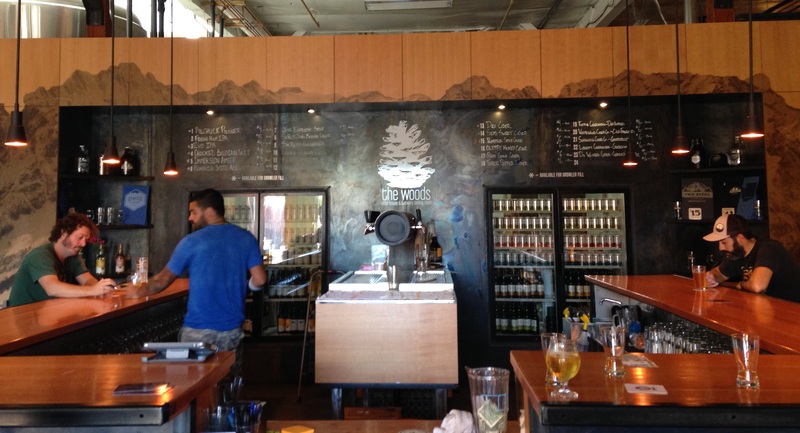 Plus I hadn’t ever been to their tasting room, The Woods (which they share with their sister brewery, 2 Beers Brewing Company). Seattle Cider ended up a bit disappointing of a stop as they only opened at 3pm, and nothing was actually going on for the Washington Cider Week kickoff yet. There were plenty of folks there though, lots of growler fills, etc. They were only setting up while I was there, but they did however have 16 ciders on tap (6 of their own and 10 from 10 other cideries), some free cider swag, and a hot dog cart. Also, I got to meet fellow cider blogger Ron from DrinkingCider.com! He had reached out that he would be in town for Cider Summit, and I let him know my schedule. 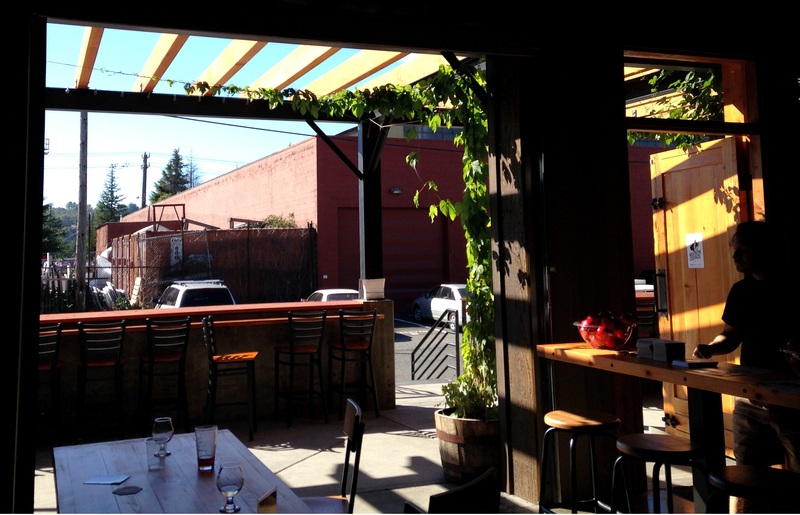 We ended up meeting up at Seattle Cider, the Burgundian, and Cider Summit, which was pretty awesome. He even brought me some cider from Tod Creek in Victoria BC which I look forward to trying; very cool. Too bad he couldn’t take cider back to CT.
We even got a mini tour from their tasting room manager. They were in production so we couldn’t walk through the cidermaking area (although they have an opening you can look through to see it), but we got to see a few areas. I learned that Seattle Cider currently only uses apples from Washington (all dessert varieties except their Harvest series). It was also interesting to hear about and see their current construction project, a kitchen! 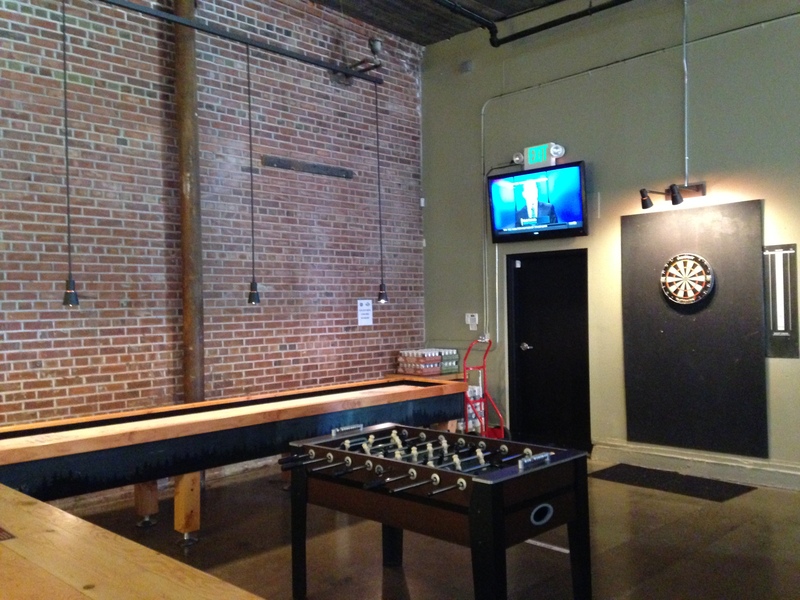 Probably a very welcome addition…more tasting room need to offer food, even if its only chips, crackers, pretzels, whatever. I ended up sampling five ciders at The Woods / Seattle Cider. Unfortunately they didn’t have a sampler, but would pour tastes. I really think a sampler is the best way to go anywhere which has multiple cider choices on tap. So, I had a couple tastes, got a glass of one, then had a few more tastes. Seattle Cider Olympic Honey. 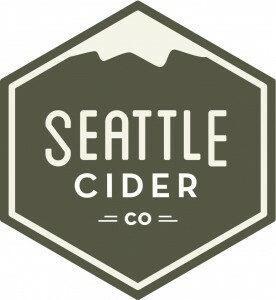 This cider is a special release (August 2015) Seattle Cider did with the Fairmont Olympic Hotel, and only available at Seattle Cider and the restaurant/bar at the Fairmont Olympic Hotel. This used honey from the rooftop apiary at the hotel. I had really wanted to try this after seeing a segment they did on King 5 local news on Facebook, so I was pleased they still had some. Retail is $9 for a 22oz bottle, but I had a 13oz tap pour for $6. 6.9% ABV. Semi dry. I picked up only hints of honey, but it was refreshing, and probably my favorite Seattle Cider variety so far (I’m not a huge fan of their ciders, although they have a large local following). Moderate acidity and and mild tartness. Seattle Cider Plum Gose. This is Seattle Cider’s twist on gose (a unique style of German beer which includes coriander and salt). It includes Jacobsen sea salt (from Portland OR), coriander, and plums, and was made using Chardonnay yeast and added malic acid. 6.9% ABV. Semi-dry. Very unique but mild flavor from the ingredient additions. Lovely light berry hue from the plums, but my taster was too small to get a clear photo of the cider’s color. Higher carbonation. A touch of saltiness. Apparently they previously had a full Gose cider, and would often get requests to mix it with their PNW Berry, so they decided to make something similar with plums. Liberty Ciderworks Crabenstein. Made using Dolgo crabapples and Gravenstein apples with wild yeast fermentation. 7.3% ABV. Dry. Tart and mouth-puckering with a touch of funk, but the flavor profile is pretty mild. I like Liberty’s Manchurian Crabapple single varietal better as it is bolder, but they are completely different styles of cider (for example, the Manchurian is 12.5% ABV). Cockrell Valley Red. Cider with Puyallip WA raspberries. This is the first time I’ve tried a cider from Cockrell. 6.2% ABV. Semi-dry. Lovely fruity nose and red hue (again, no photo; sorry), acidic, and tart. I didn’t pick up raspberries (nor did I know that was the fruit they used until I researched this cider), but for me it was more of a general tart berry than a specific flavor. It reminded me some of Snowdrift Red (which I prefer). Grizzly Ciderworks Woodlander Wit-Style. They modeled this cider after Belgian wit-style beer (they used that variety of beer yeast). I’ve previously tried their Ridge. 6.7% ABV. Semi-dry. Smells slightly woody. I didn’t pick up any of the orange peel or coriander they included in this cider, but again, it was a pretty small taste. I found it very similar to their Ridge, but slightly more sweet, tart, and complex, and slightly less flavorful. I prefer the Ridge, which I found to have more of the woody & earthy notes I enjoy. This is just the start of my Washington Cider Week posts, so stay tuned for posts on Thursday night part 2 (Burgundian with Eden & Alpenfire ciders), Cider Summit, and events I’ll be attending next week at Capitol Cider and the Schilling Cider House! Subscribe to Cider Says using the sidebar (on the right or at the bottom of the page on mobile devices) and like us on Facebook to ensure you don’t miss out!